For a while now, Al Jadeed (one of Lebanon's controversial television stations) have been copying Lebanese bloggers' content and pasting it as is on their website without asking for permission. Some can argue that Al Jadeed is helping out the bloggers by giving them more exposure but this is not the case here. The second a website or a blog has advertising banners on it, it becomes a commercial website that aims to make money through impressions and clicks on those ads. Additionally, since AlJadeed.tv is a website for a commercial TV station that promotes its shows, there is not doubt that it is a commercial website. When such a website copies bloggers' content, it aims to increase traffic to their pages and hence increase profits from ads. Bloggers have a hard time creating original content and copying their content without consent is unethical to begin with. Would Al Jadeed be happy if another television aired one of their popular shows without their consent and added their own advertising to it? I don't think so. They would be in court the next day! But this is not just a matter of ethics. Even if Al Jadeed is attributing the posts to their original bloggers, there is a matter of copyright. Most blogs that they are copying from are under a Creative Commons (CC) license. While an open license would allow Al Jadeed to use the bloggers content freely (with or without attribution depending on the license), most bloggers opt for a non-commercial CC license to protect themselves from people like Al Jadeed who want to make easy money off other people's hard work. 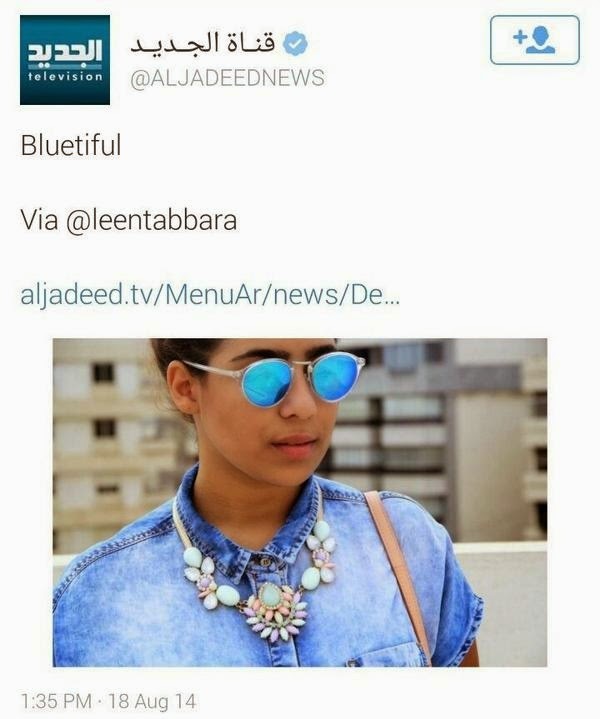 Al Jadeed violated the law in many instances including stealing content from fashion blogs Le Journal De Leen and Nouchaline (including a copyrighted article from Cloud961 Magazine). With this in mind, bloggers who have been violated can rightfully sue the TV station under the Creative Commons non-commercial license or copyright law (depending on what they are using for their blog). In case this happens to you, I urge you to contact Al Jadeed to take your post down and refrain from doing so in the future to protect your content. 500 views (on average) on their website is not worth getting your name associated with such a trashy television station. In addition, if you feel that this violation is worth a lawsuit, feel free to drop me a message and I can link you to a certified Creative Commons lawyer who is an expert in such crimes. Al Jadeed needs to realize that a lazy social media strategy isn't getting it anywhere. To be professional, they need to invest in creating original content instead of copying other people's hard work. An apology should be issued to the bloggers who were violated. In case they would still want to continue with using other people's work, a written consent is required for copyrighted blogs and blogs that operate under a non-commercial CC license. To set-up a Creative Commons license for your blog, visit their website and follow the steps. UPDATE: The person responsible for Al Jadeed Blog replied and said that he will continue with this behavior. I know that's an old post, but we can see this almost everyday on the net. Someone must do something about it.